We visited Cinque Terre in March (when many places are closed.) On a day of national rail strikes. With a dog. Seriously, in terms of planning the optimum time to visit this beautiful part of Italy, we did not do well! Still, I figure a decent Cinque Terre blog should share the bad, as well as the good. So this is a no-holds-barred post, telling you what it's REALLY like in one of the biggest tourist-spots in Italy, whether you can ‘do' the Cinque Terre towns in one day, if you should visit in March. Or with a dog. And what on earth do you do during a rail strike…!?? What and where is Cinque Terre? Cinque Terre in March – is it worth a visit? How do you get to Cinque Terre with a motorhome? DO NOT DRIVE TO CINQUE TERRE WITH YOUR MOTORHOME. EVEN IF IT'S A CAMPERVAN! Cinque Terre in a car- Can you drive to Cinque Terre? What is the train station at Cinque Terre called? Taking a dog to Cinque Terre- is it allowed? Cinque Terre in one day- is it possible? Cinque Terre is a National park in North West Italy, which became a UNESCO world heritage site in 1997. The Cinque Terre towns are linked by train, footpaths and some terrifying roads! The area is managed using ‘responsible tourism' and hopes to showcase the delicate balance between man and nature working in harmony. In a nutshell, it's some of the most breathtaking scenery you will ever see, alongside people living and working the land. Here are the 5 towns of Cinque Terre. I've also marked Levanto, which is where we stopped to watch the beautiful sunset. There are 5 towns in Cinque Terre. It's impossible to see how big they are, as they're built on a cliff, but many people refer to them as villages- who knows which is right!?!?! Absolutely! A lot of cafes and restaurants were closed, but the views and the pretty villages are still there. Having seen some of the photos from people who have gone in summer, I think March is a PERFECT time to visit, especially as part of a road trip. There were very few crowds, you could get a seat anywhere you wanted and the queues for the ice cream weren't too long! There are several ways to get to Cinque Terre- and the best routes all involve train. Sadly, we were in a motorhome. Let me make something very very very very clear. Are you sitting comfortably??? Those roads are TINY. And steep. And there's pretty much nowhere to park when you get there. Just trust me on this- park up at a train station and get on the train. Or leave the motorhome in a campsite and get a taxi to the station. Anything except try to drive to ANY of the Cinque Terre towns! For reasons stated above, we didn't drive at all in Cinque Terre (although we did walk up several of the roads and wonder how many clutches the locals go through each year!) We also met an American couple who hadn't realised quite how terrifying the roads were and had driven up from Florence. The poor gentleman was still looking a bit white. The roads to get to any of the Cinque Terre towns are tiny even for a car and, apparently, parking was a nightmare- there are signs and restrictions everywhere and this was only in March! This is the route we picked. We actually found a campsite in Deiva Marina, which is another two stops up from Levanto. We arrived at the train station… and it was impossible to buy tickets. You have to purchase tickets from an automated machine (luckily you can select English). 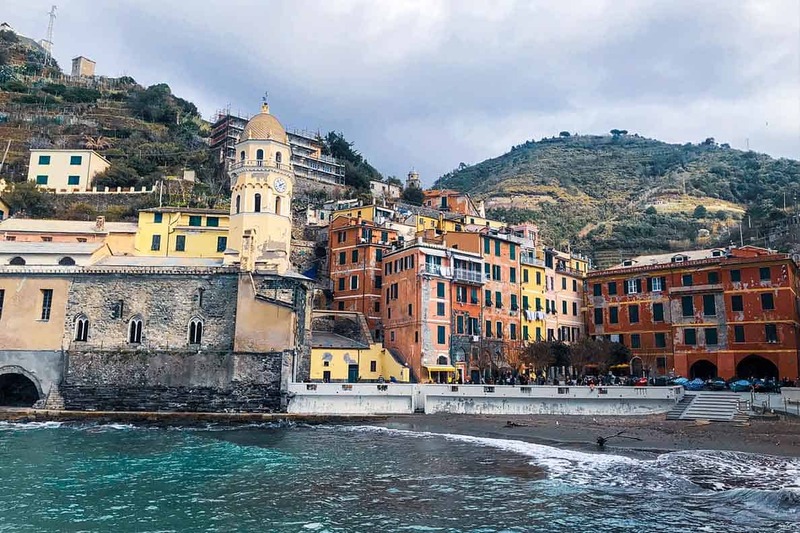 Normally, you can buy something called a Cinque Terre pass, which allows you to hop on and off the trains within the Cinque Terre park as much as you like. I believe it also allows access to some of the hiking paths. However, this pass was unavailable for us to buy. Maybe it was because it was March, or because of the damage over the winter (there were a lot of storms and many of the footpaths are currently closed due to damage and falling rocks.) Either way, the only option for us was to get on the train without a ticket- although we did buy a ticket from a conductor onboard without any problems, so perhaps they knew the machines were out. DO NOT FORGET TO VALIDATE YOUR TICKET. When you get the ticket out of the machine, look around for a green card reader on the wall. You MUST put all your tickets into this machine and get it stamped. It doesn't matter which way round, it doesn't matter which way up, but it NEEDS to be done. I forgot on our very very last trip, which was 10 minutes long… and we were fined 100€ (50€ each… he let us off for the dog!) I was gutted- I'd remembered all day for all the other tickets, but rules are rules. 🙁 It was an expensive lesson. NOTE- the validation of each ticket is only valid for 75 minutes AFTER you've stamped it. So don't try and be clever and stamp them all early- it doesn't work like that. Also, if you're spending a couple of hours at a village, don't stamp the next ticket until your return to the train station. This is the other main route to get into Cinque Terre. Park up near here and get the train from La Spezia to Cinque Terre. There are several campsites/ sostas nearby, although please your discretion before leaving your van unattended all day. Also, beware of pickpockets on the trains- they are a common and unpleasant problem. Flamsbana Railway- the most beautiful train ride in the world? Each village has its own station. So you want a ticket from La Spezia to Monterosso (for example) or you want a pass which allows you to stop at each one without getting another ticket. This is the weirdest thing I've ever heard of. When we arrived at Riomaggiore, our first stop, we spoke to the lady in the ticket office, who informed us that the trains were on strike that day. We looked at each other in complete confusion- after all, we'd just arrived by train without any problem. Then the worry set in- we were about 60km from our motorhome, in a tiny town on a steep cliff. With a puppy. How were we going to get out of Riomaggiore if there were no trains?? It was an awfully long walk. We must have looked terrified, as the lady in the office was swift to reassure us. And she was right- all day, every single train arrived, on time, and without problems. There were even staff on the trains. Seriously- it was bizarre! I don't know if this is normal Italian strike behaviour, or if we were just lucky, but we were very grateful! The lady told us to buy individual tickets for each stop, so we did. Full costings are below. A ticket for your dog (bought at the automated machines at the same time as you buy yours.) You actually get a printed ticket saying ‘dog' or animal. Pet paperwork. You need to carry the pet passport and proof of all injections etc with you. Dogs were very welcome in restaurants and cafes. Both places we stopped at offered dog bowls with water. There are regular bins to dispose of any ‘business'. We really enjoyed being able to bring our puppy. We didn't let him swim in the sea as it was too rough, much to his disappointment. I'm not sure dogs would be allowed on the beaches in summer but there are plenty of other places to take them. It's definitely a dog-friendly place. Yep. Absolutely. We did it in about 9 hours. It was a long day, with a LOT of walking and, given the choice, there are some places I would have stayed for longer, but if your options are either go for a day or don't go at all, then definitely go. We decided to skip the middle village, Corniglia, as we'd heard it was the least attractive of the five- and there was a steep walk of 200 steps just to get up to it! As we were pushed on time, we skipped it and spent longer elsewhere. You could, of course, add it into your itinerary if you wish. This was our very first Cinque Terre village and honestly, it was a disappointment. Paint was peeling from all the walls, there was washing hanging out everywhere, all the boats had been lifted out of the harbour and the waves and surf were so strong that the harbour was completely closed off. I have seen the photos of Riomaggiore in summer, and it looks idyllic. Sadly, it was not at it's best for us. We stopped at a little cafe and had a coffee and a croissant for second breakfast (don't judge), but even with yummy food, the place didn't grow on us. Riomaggiore- our first Cinque Terre town! Ok, now we're getting there. This one was BEAUTIFUL. I had been wondering what all the fuss about the Cinque Terre towns was about, but I got it here. We sat and had lunch by the beautiful harbour. Mac made friends with some guys playing football, and they were kind enough to run him in circles for about 20 minutes! It was a lovely, quintessential Italian village with AMAZING shops (although they were expensive!) Would happily have spent the rest of the day exploring the streets and enjoying the views. The harbour was closed here too and the boats were piled up in the square, but it just had a lovely feeling. The good feelings continued. This one was also gorgeous. I'll admit, the sun had come out, it was warm and we had ice cream! The beach was beautiful- you could see it from the train station. It was a pleasant 10-15 minute walk around the headland to the main town, which was really pretty. Lots of little shops, cafes and restaurants, as well as an amazing black and white church which was HUGE! Monterosso- one of our favourite Cinque Terre towns. We only had an hour, (we had to be back at Deiva by 7pm to catch the last shuttle bus back to the campsite!) but luckily sunset was at 6.30, so we headed to the beach. Something which caught us out about Levanto is that the train station is NOT on the beachfront, unlike the Cinque Terre towns. You need to walk into Levanto, which takes about 15 minutes (we did it in 10, due to an over-excited puppy!) The beach was full of campervans with surfer dudes who had parked on the seafront and were enjoying the waves. I think it would be a fun village to hang out in, the bars and restaurants were open and looked lively. We fancied dinner here, but sadly if we stopped we had about a 3 mile uphill walk back to the campsite… didn't seem very appealing after a long day! Drones in Cinque Terre are strictly forbidden. I can understand why, although it is a bit frustrating when you know it would make a stunning photo. Still, they have been known to prosecute, so we didn't risk it. Wear comfortable shoes. There are lots of steps, cobbled streets and hills. I'm sure some women could do it in heels or cute shoes- I am not one of those women. Trainers were a great idea! Along the same lines, I think families with young children might struggle. Strollers/ pushchairs might be a pain in those streets, although some are definitely better than others. It would be doable, but be prepared for a hard slog uphill at times! Have at least one ice-cream. Ideally two. Stop for lunch somewhere pretty. Yep, it's probably more expensive than a restaurant outside of Cinque Terre, but the views are beautiful. Carry a bottle of water with you. Some of those hills are STEEP- even if you're not hiking between the villages. Start early, especially if you're doing all the Cinque Terre towns in one day. You can easily see at least one village before breakfast and you're going to want longer to explore in some places than others. BRING A CAMERA. And spare batteries. This is absolutely the place for tripods, posh cameras and taking your time to compose a shot; especially if you're visiting in March or out of season when there are fewer people! Include Cinque Terre in a wider Italy itinerary– there are so many incredible places to explore!! Have you ever visited Cinque Terre? Which was your favourite Cinque Terre town? Do you feel riding a motorcycle/scooter through the Cinque Terra towns would be a viable option? Sadly, not really. You might be able to get down to them, but there’s still the issue of parking when you’re there. Most of them are on very very steep cliffs and trying to walk around in bike gear might be a pain too. But we didn’t do it, so I guess it might be possible! !